I have a thing about children knowing their neighborhood – really knowing it – from the cracks in the sidewalks to the fire hydrants and stop signs, from the neighbor’s house five doors down that’s decorated for every occasion to the older senior citizen who’s always at her window, ready to wave. This connection to where children live, these on-going observations and awareness create a significantly strong sense of belonging, confidence, and meaningful relationship to the immediate real world around them. What’s there to look at some might wonder. Nothing much goes on in our neighborhood. Leave it to a slow pace and perceptive children to help you find out. When there’s nowhere special you have to be, no time frame you have to meet, the walk in the neighborhood will establish itself as a relaxed, interactive family activity. Done often, it will instill familiarity, bonding, comfort and the joy of discovery together. As soon as your children are able to walk, leave the stroller behind. It’s the act of walking, looking, stopping, bending, picking up, pointing, asking questions that is the purpose of this walk. It’s not to get somewhere fast or to get it over with. It is to capture and appreciate the simple pleasures and treasures right on your block. There’s no agenda or check-off list when beginning your neighborhood walks, other than leaving your cell phone behind. Just do it. Things will evolve spontaneously. Neighbors seeing you pass by often will recognize you and stop and say hello. Children will learn their limits; they can run ahead to Mrs. Jones’ house, then stop and wait or know that it’s okay for them to climb up and down the three sidewalk steps at the brick house. They’ll remember where the best puddles for splashing form after a heavy rain and that it must be Thursday because the trash cans are out. You don’t get acquainted with the neighborhood animals zooming by in the car. Watching squirrels at work and play, observing a bunny sit motionless beside a sheltering bush, greeting the local dogs also out walking with their families in the neighborhood, waiting to see the first robin of the season is just plain fun. Providing our children with this simple opportunity of neighborhood walks is a gift that will resonate in them throughout their life. It brings relief from the constant frenetic pace and virtual world we find ourselves in and provides a firm grounding on which to later explore the world. One of the most significant tasks parents undertake in raising their children is establishing a solid sense of belonging for them and conveying that they are loved and secure in the embrace of their particular family circle. It is within the context of this circle that our children draw courage, trust, resilience, and understanding when terrible events happen in our world. I’ve talked with several parents about the recent earthquake in Haiti. They were unsure how much information their 4 and 5 -year-old children needed to know. A mom shared her 5-year-old’s complaint of tummy aches after talking about Haiti’s traumatic situation at school. One of the most important measures for parents to take is to limit television coverage and monitor what information their child is hearing. When children see the graphic pictures of devastation and death, it is overwhelmingly frightening. Children are fooled by the on-going news cycles believing that the earthquake is continuing everyday – all day. Viewing the vivid scenes of destruction and personal tragedies is too raw for children to experience. At times like this, when our children hear that homes have been destroyed, people killed, parents and children separated, no food or water to eat or drink, no where to live, it is incomprehensible for them, as it is for us. People will argue that in today’s world, we want our children to be global citizens, to share in empathy what others are experiencing and it begins with informing the children of these events. Here’s where I believe again, that less is more. For children, the knowledge that the country of Haiti and the families who live there have experienced a very serious earthquake and need help from others is sufficient. Who helps them? Our focus should be on the helpers, those who come to the aid when things go terribly wrong. Airplanes and helicopters and ships full of food, water, clothing, doctors and nurses, firemen and soldiers, adults who volunteer, all helping the children and moms and dads and people of Haiti. Deciding that your family can also be helpers is a positive, constructive means allowing children to be involved at a level they can relate to. How do they think we can help? Can we send money, donations of needed goods, a teddy bear? Could we draw pictures thanking all those who are helping the people in Haiti? For school age children, it is important to answer a child’s questions truthfully and accurately without giving them more than they are seeking. Ask them what they’ve heard and correct any wrong information. It is still important to limit news coverage for this age also, not dwelling on the tragic details of the event or allowing it to dominate their experience. Some children may show signs of stress, have trouble sleeping, want to be close, need to know where the adults in their life will be, become easily scared, working out some of their anxiety through behavior. Your presence is invaluable at such times – comforting routines, quiet bedtime talks, the warmth of your family circle. You may notice children incorporating the events they have knowledge of into their dramatic play. After September 11th, I heard from many parents and teachers that children were constructing block buildings and flying airplanes into them. The adults were concerned that these children were insensitive about the terrible tragedy that had occurred. Actually, these children were dealing with their feelings and handling their emotions through play, trying to make their own sense out of a very scary situation, by facing it. All of us watching the horrific scenes and knowing the suffering that is taking place can only begin to imagine the pain these families and people of Haiti are experiencing. It is times like this that we are so very grateful for our community, our friends, our family, our own circle of love and strength. Comments Off on Will I be safe? On Friday at Play Shoppe, we painted. I love the freedom painting offers children. So simple! Paper, paint, brushes, and time – to experiment and satisfy their individual creative urges. Observing, we see some children choose to use only one color, glopping on the paint and dreamily smoothing it out across the paper. Others use every color available to them, lost in the pure thrill of swirling color upon color. Then there are those children who forgo the brush altogether and readily get their hands right into the paint on their paper. And still others who hold up their hand almost immediately to be wiped at the first spot of paint on a pinky. In art, there is no one right way as any artist will tell you. Art is most definitely a sensory experience of color, touch, blend, flow and design, satisfying the hands-on curiosity of children. That’s why at Family Resources, we try so hard to offer creative activities that children can do independently. When a model is offered, we want it to be only a suggestion of what could be done. I love to have children be able to select just what they want to use from a variety of materials. Whether it’s making a paper jack-o-lantern, a snowman, a collage, or a crown to wear, every piece will be different if we allow children the opportunity to make their artwork their own. As parents, sometimes it’s hard to stand back and watch our child’s creative development unfold. We want so badly to put those eyes where they’re supposed to be, add some more yarn for hair, a little less glitter and more detail. But allowing our children this freedom of choice is essential in building not only their creativity but their confidence, competence and judgment that will carry over into other areas. And to tell you the truth, those very art projects that represent their true stage of development will bring the most oohs and aahs as you pull them out years later and wistfully remember the pure simplicity of this time. We don’t need to wait until children have grown up to appreciate their creations, however. Framing art projects that our children have done will look absolutely charming gracing the walls of our home. What better way to show our children their work is valued. If you’re looking for ways to connect and introduce creative activities in your home, check out our” non-virtual” Live Chat Room – Tuesday, January 19th meeting at Family Resources from 6-7:30 p.m. This month we will be focusing on Creative Themes, finding out how easy and fun it is to simply build your family’s activities around a common theme, including ideas for art, foods, activities and reading. Registration is necessary at 784-8125. A number of limited childcare spots are available. Call Fran if you have any questions. This has been a weekend of high emotions for me. I am honored and thrilled to have been named the La Crosse Tribune 2010 Person of the Year. This recognition came about through the efforts and initiative of very special parents which makes the joy and meaning of this award that much more significant to me. I offer a sincere thank you to those who made this tribute happen. I am deeply appreciative. You can be sure this is something that will sing in my heart and soul forever. Now … another magical moment! 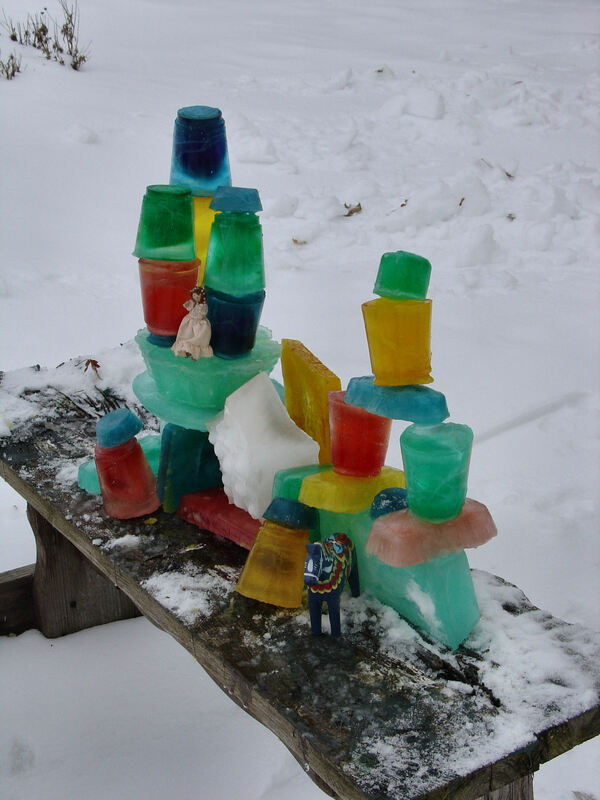 My daughter reminded me this weekend about one of her most favorite childhood memories that we would do when the temperatures dropped below zero – a fanciful, never-to-be- forgotten ice castle. It’s easy enough to do, if you’re willing to brave the cold. And it’s worth braving the cold for the sheer beauty and fun of it. This is definitely an all-family activity. You can use all the help you can get, leaving you and your children enchanted by the finished project. Here’s a photo of the ice castle my husband and I put together today to get your imaginations stirring. Throw open those cupboard doors and find everything and anything that you can fill with water – as many different shapes and sizes as possible. Pans, tupperware, jello molds, cupcake pans, pie pans, roasting pans, plastic glasses. Fill them with water. Put desired amount of food coloring into each. Next – this part is adult work – carry these carefully outside to freeze. That’s the benefit of creating your castle during the coldest time of the year. It won’t take too long to freeze and it will stick around awhile for your enjoyment (though do be patient; leaving them overnight is probably best). When the ice has set hard, bring the frozen pans back inside. Run some water on the back of the pans and out should pop your forms, handing them off to be carried outside. Putting the structure together is easy. Squirting some water from a squirt bottle onto one of the frozen forms of ice will instantly freeze it to the next piece. The building goes very fast now. Pop out, squirt with water, stick on and your castle is rising. Stick things here, there, anywhere you choose until all have been attached. There’s no one right way to do this. That adds to the spontaneity and fun. Now, into the house for a quick warm up, change of gloves, a sip of hot chocolate before going back out with the whole family to admire what I hope will become a favorite memory and a magical moment for your family as well. Don’t forget the camera! Thanks for the memory, Aimee.